40m². Spacious suite with sitting area and wonderful views to the landscape. 45m². Comfortable room with sitting area and splendid views to the golf course. 65m². Luxury suite with Jacuzzi, lounge and golf views. 35m². Comfortable room with classic decoration and splendid views to the lush landscape. Located in San Martin de los Andes, Loi Suites Chapelco is a hotel standing in the wonderful landscape of The Andes Mountains, an intimate and peaceful place ideal for rest and relaxation. The rooms are designed in a classic style with warm colours, natural materials and parquet floors, offering stunning views to expansive lush green golf course lawns and the majestic Andes Mountains. Los Coirones restaurant is a chic space, serving exquisite International cuisine, in a convivial ambience, surrounded by mountains, valleys, rivers and the unbelievable combination that only Chapelco can offer. After a delicious meal, join the lobby bar and enjoy your favourite drink. Loi Suites Chapelco hotel also offers a heavenly Spa where you can relax and forget the daily stress, with Relax treatments, water circuits, equipped gym, indoor swimming pool, and a wide selection of massages. 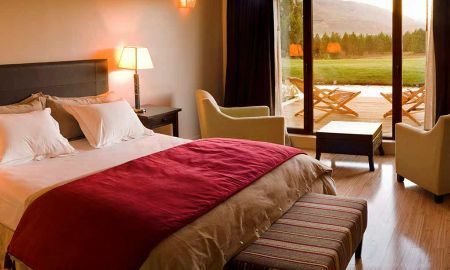 Loi Suites Chapelco hotel is located in San Martin de los Andes, a town in Argentine Patagonia in the foothills of the Andes Mountains.